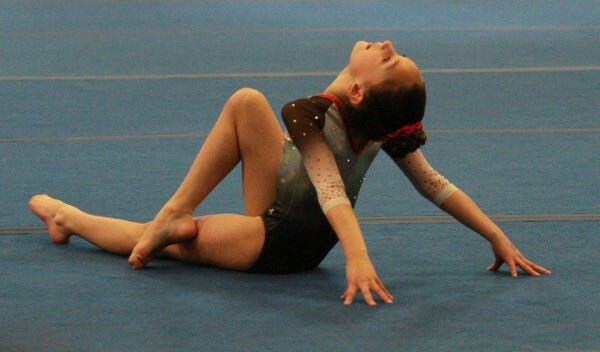 My 8-year-old daughter is a competitive gymnast. It’s a world I never could have imagined, because it means spending up to 20 hours a week in the gym for the athlete – rigorous conditioning – and a lot of juggling for this CEO/mom of 3. It also comes with a lot (lot) of tears as part of the development process. This isn’t a sport you can tell your child to do; the drive comes from within, and we do our best as parents to provide the support needed…but it isn’t always easy. My daughter is experiencing a mental block, which is common in this sport – but emotionally painful (and frustrating) to watch. She wants to do a skill that she knows how to do and has done for years, but her brain won’t let her body do it. Without going into the psychology behind it, hers is a very textbook situation that with time and strategies, should get better. I was feeling her pain the other evening after yet another practice, when, from the back seat of the car, she says, “Mommy, sometimes you just have to go back to the basics. I am going back to the basics.” She didn’t say another word. In my rear-view mirror, under the passing street lights, I saw the silhouette of her beautiful, petite face as she stared out the window. It was a moment – a moment that is etched in my heart and mind forever. The Talent Acquisition industry is experiencing so much change, and some of the most incredible technology is advancing recruiting in ways we never thought possible. Our job at Beacon Lane is to help clients prepare for those technological advancements because, in reality, many (many) organizations are not ready. They don’t have standard processes in place, they lack a defined growth strategy that addresses their unique pain points, they don’t have the right ATS in place to support standardization, and they aren’t using data analytics to inform their decisions. Without these and many other fundamentals, organizations are simply not able to optimize the wonderful array of technology solutions that are available. As any parent knows, you are only as happy as your saddest child. Driving home with my daughter, I felt my emotions transition from pain to calm. She summed it up so beautifully in her 8-year-old way: “Sometimes you just have to go back to the basics.” This is what we help clients do at Beacon Lane. For a very short time, we hit the pause button, go back to the basics, and help tighten up their recruiting foundation so that they can properly build. As HR leaders, I encourage you to consider whether you truly know where your best opportunities are for innovation. I also invite you to consider going back to the basics for a short period of time to ensure that you have what you need. Many leaders are afraid that if they stop, they will miss out on the next bright shiny object. It’s simply not true; the objects are all there for the taking. You just need the courage to pause, even when everyone else is running, and ensure the basics are in order. If this resonates with you as a leader, I invite you to schedule a strategy call directly with me to discuss your Talent Acquisition function and how Beacon Lane might be able to help you hire – better, smarter, faster – by examining and fine-tuning your basics.